Soon after I wrote on the best available pole saws, I had myriads of people requesting me to write on table saws or circular saws as most would call them. As a woodworking enthusiast, a table saw constitutes an important part of my tool arsenal, so all i needed was an excuse to write what I believe is the best available table saw in the market today. No matter what other tools you may have, it is a craftsman table saw which improves your craftsmanship by helping you flexibly make straight, joint and groove cuts to handle different projects. It also reduces your cutting time while making repetitive cuts, at the same distance and depth without making repeated measurements, when used with a T-slide. Moreover, you just have to buy its accessories to expand its functionality! The Best Table Saw In The Market That Money Can Buy! It saves hours of your research as most of a table saw s aspects have been compiled in a single page. In addition to this, here is a comprehensive review of 6 of the more popular devices in the market to help you with your decision. Weighing only 22kg, the Dewalt versatile 10-inch Jobsite is the most portable table saw in its class. It has a powerful 15 amp motor, large 20 ? rip capacity and comes with blade guards, a push stick, a miter gauge and a 10 ?, 24 tooth carbide blade. Its blade spins at 3850 RPM for assured clean cuts and its coated table surface reduces friction for improved cuts. The saw comes with a 3-year limited warranty, 1 year free service contracts and a 90-day money-back guarantee. Lightweight and portable, this tool can be taken wherever required. Its powerful motor assures high performance in all applications. The Dewalt Site-Pro Modular Guarding System simplifies setting up of various applications through tool-free adjustments of specific components. Its steel roll cage protects against impacts and its clear scales, rack and pinion fence systems and front and rear fence provide an easy to use, accurate saw. 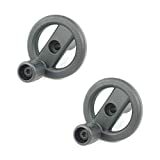 Its quick bevel lock assures easy and accurate adjustments. Comes with a 2 ? dust collection port for easier cleaning up. The Dewalt is okay but their service is poor if the tool needs servicing. Some complain its miter gauge is worthless and does not give an accurate crosscut. The saw s factory settings weren t exact and many had to make adjustments to most things. If you are a woodworking enthusiasts, it s worth including the Dewalt DWE7491RS 10-inch Jobsite in your tool arsenal. This saw has a 32 ? rip capacity which simplifies cutting of large shelves and trimming materials. You can easily rip through hardwoods with its 15 amp motor and its 2 ? dust collection port is connected to a vacuum for thorough dust extraction. Its rolling stand is easily set up and dismantled with excellent stability while its large wheels make rolling the saw over steps, curbs and jobsite debris so easy. A rack and pinion fence system gives accurate cuts and precise positioning. 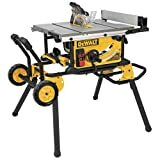 A portable Dewalt, its strong motor easily rips through hardwoods. Its telescoping fence rails can be easily extended and retracted as required while the flip-over ripping fence facilitates narrow rip cuts. Stand is very stable and easily set up or dismantled and its wheels help easily carry the saw over debris and curbs. Some complain its table is not flat which can give disappointing, inaccurate cuts. Poor miter gauge because of its wide miter slot. A plastic clip holds the blade guard instead of screws, which is a major safety issue for a portable device. Its power on/off switch is hard to use and its stand has a cool design but is rather wobbly. The Craftsman Evolv runs on a potent 15 amp motor which easily cuts through tough materials with its 10 ? table saw. This saw includes hex keys, stand, anti-kickback pawls, push stick, miter gauge, blade guard assembly and 24T carbide tipped blade. Its advanced guarding system provides for better versatility and its upper guarding assembly is installed via a clamp and latching action. While the safe fence is quick release mounted for fast rip adjustment, its push button assembly simplifies the anti-kickback paw. Its easily adjustable miter gauge ensures quick and accurate control of corners and tight bevels. The Craftsman Evolv s potent, stable and powerful 15 amp motor and provides a smooth cut through even 2 ? thick and dense hardwood. Safety is its priority with its superior blade coverage and advanced guarding system. Riving knife position is easily adjusted by the spreader using a tool-free internal cam lever. Its large steel top working surface supports any sized material. Its steel stand has a comfortable working height, is stable and durable to work on. The saw is lightweight, portable and its blades can be easily changed. Some complain that the Craftsman Evolv is inaccurate and dangerous to use to cut anything. Its table is too lightweight; the entire saw jumps when switched on. It s difficult closing the fence square to the blade and fence measurements are inaccurate. Looking for a robust table saw? The Dewalt DWE7480XA with Guarding System and Stand might be just what you are looking for. Fence adjustments are so fast, smooth and accurate with its rack and pinion telescoping fence rails. Its 24 ? of rip easily cuts through various large shelving and trim materials while its 15 amp 4800 rpm motor rips through hardwoods. The saw s adjustable rear feet helps level the saw on uneven work surfaces while its table coating reduces friction to give smooth cuts. The Dewalt DWE7480XA uses a 10 ? blade with 5/8 ? arbor size. Comes with a strong and durable stand which can be folded flat while storing. Its rack and pinion telescoping fence rails helps make smooth, accurate and fast fence adjustments. Its 2 ? dust port connects to a vacuum to catch saw dust. Its on-board storage provides for easy access to place stick and Site-Pro Guarding components when not in use. Its stand s support bar hardware holes help secure the tool to the stand. Hopeless miter gauge with an ABS plastic protractor part. The table s in-feed length is too short, making it difficult to align parts even with a feather-board. It s off switch pulls up and out and has to be pushed down with your hands to shut it off, making the saw rather difficult to use. The Bosch 4100 is famous for its features and enhancements. It provides the industry with the first modular smart guard system, t-slot miter gauge, SquareLock Rip Fence and a robust sub-base with carry handles. Its modular smart guard system includes a blade guard, anti-kickback pawls and riving knife which are modular and tool free for users to quickly and easily remove and add components as required. Its gravity-rise stand with pneumatic wheels makes this the perfect device to carry to any work site. Its 15 amp motor runs at 3650 rpm to provide for high precision cutting. The Bosch 4100-09 comes with a durable sub-base and integrated carrying handles for its easy and quick transport. Its gravity-rise stand with pneumatic wheels handles the toughest terrains with ease and its collapsible design minimizes storage space. Its single point bevel movement improves accuracy while its arbor lock systems makes blade changing quick and easy. The Bosch 4100 table saw is backed by a one-year limited warranty, one-year service protection plan and a 30-day money back guarantee. Some complain that the riving knife assembly is loose and not square to the table. No alignment instructions in the manual. Not possible using a thin kerf blade with its new riving knife/guard system. The Bosch table saw miter gauge floppily fits into the slot. As the blade height cannot be locked, it may slowly change with vibrations or accidental nudging while working. Despite being hooked to a shop vac, lots of saw dust is strewn about. The Skil 3410 with folding stand is perfect for DIY woodworkers tackling bigger projects. Its 3-1/2 ? height capacity helps slice through 4x materials. Its self-aligning rip fence gives accurate measurements while EZ view measurement system gives accurate settings. The table is easily set up with its Quick Mount system on a durable steel stand. It s 20×26 ? cast aluminum table can be extended to a maximum of 20×32 ? to use with longer work pieces. It s 15 amp motor lets you rip through various wood types. Assured of accurate settings and measurements with its EZ view measurement system and self-aligning rip fence. Extendable cast aluminum table for longer work pieces. A 15 amp motor and 3-1/2 ? cut height capacity provides the cutting capacity to handle all types of woodworking jobs. Can be easily stored with its durable steel folding stand and quick mount. The blade tends to wobble while raising and lowering. Miter gauge is sloppy with non-standard slots. The table s brittle cast aluminum may crack before bending on impact. Sloppy and poorly applied front label. It s important you know that unlike a standard saw, table saws tend to move the material you are cutting towards the blade as the blade is in a fixed position. This is how it gives you a more precise cut. The saw makes long, straight and rip cuts with wood grain and repeated crosscuts across wood grain much more accurately than handheld circular saws. It can also make miter and bevel cuts. There are two main types of devices - portable and stationary table saws. 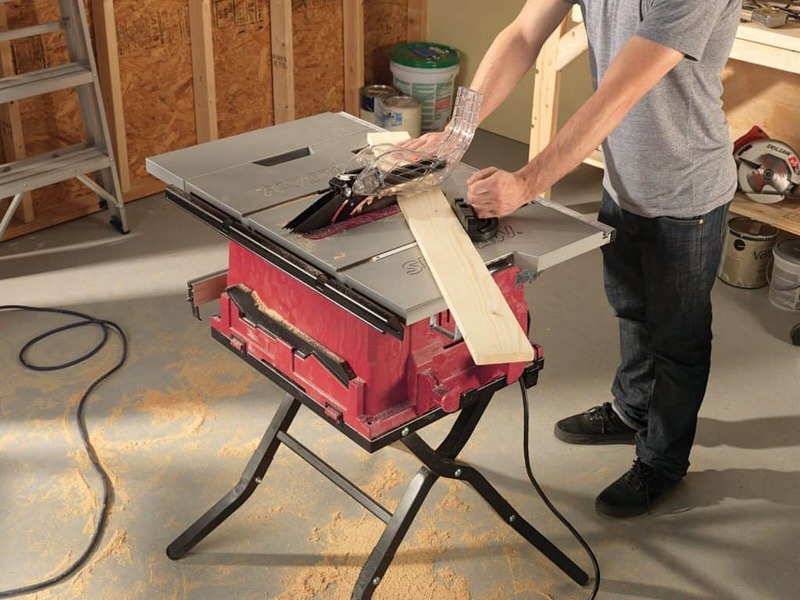 The portable are also called bench top table saws, which are the perfect choice for framing, deck building and use in shops with limited space. These saws come with unique, lightweight, small and compact portable stands, and are thus best for workers who cut wood at various locations. They are usually made of aluminum, plastic or steel, fit on the top of benches or tables and have direct drive motors. However they are rather unstable as though they can perform basic functions like large saws, they come with lesser horsepower and are usually noisier than larger counterparts. They can t cut thicker woods cleanly and don t give precise cuts; so they are not the best choice for fine woodworking. They are also typically less durable than other table saws and is the best choice only if mobility is your top concern. Otherwise, it s better investing in a stationary saw. These tool are heavier less compact than portable saws, and come attached to a stand. Though not as lightweight as portable saws, they can be moved in vehicles with ample space. However they can get difficult to tune if moved around too much. 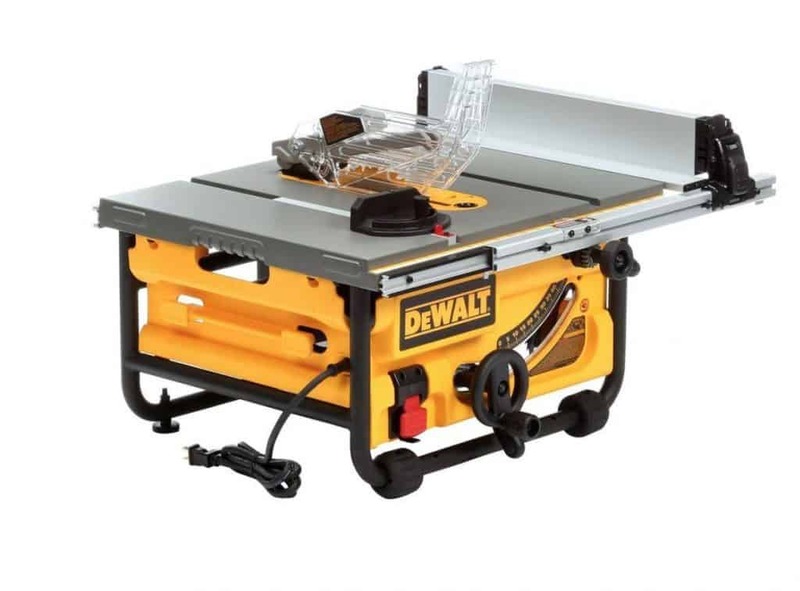 They may have a direct drive motor or belt drive motor and are slightly more expensive than bench top saws. They are popular with hobbyists and homeowners for its larger size, power and reasonable price. These saws usually have a motor with 1.3-4 horsepower, a lighter duty fence and no cabinet, and can be used for advanced woodworking by adding a better blade for specific cuts. 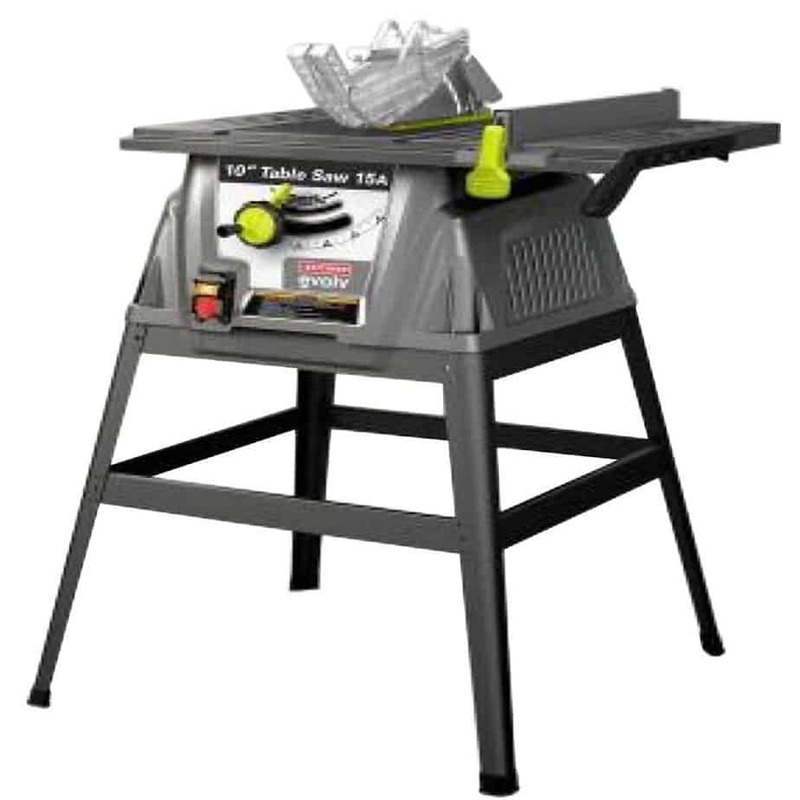 This is a professional grade saw used in professional woodworking environments. They come with an enclosed base which looks more like a cabinet. They are rather heavy, large in size, robust and powerful, which is necessary for improved accuracy and for reducing the vibrations created by its 3-5 horsepower motor. These device are considered to be more durable than contractor table saws and facilitates better dust collection through its built-in dust port and enclosed cabinet base. They have more cast iron and steel than others with more powerful motors and heavier gears, are thus the best choice for cutting heavy and solid wood and can relatively carve through thick steel and iron. While the cabinet also makes the motor quieter, these tables saw weigh about 600 lbs., and are thus not easily moved around! They may in fact even require electrical rewiring in residential settings for its required power. While cabinet table saws may be a bit expensive for casual hobbyists, professional woodworkers feel there s no substitute! Baileigh TS-1248P-52 Professional Cabinet Style Table Saw, Single Phase, 48" x 30" Table, 52" Max Rip Cut, 5 hp, 220V, 12"
As the name suggests, these saws were developed with the intention of merging the best features of both the contractor and cabinet saws at a reduced price. They are like contractor saws but have an enclosed cabinet which reach the floor, or a shorter one standing on legs. Its cabinet base ensures the motor remains quiet and helps with dust collection while it has better gears than a contractor saw. These saws can be accurately tuned and are lightweight enough to move around. Its reasonable price makes hybrid saws reachable for home hobbyists for some cuts which would otherwise require buying a huge cabinet saw. It has a circular saw blade mounted on a high speed electric motor powered arbor. The motor is mounted to an adjustable stand and large metal table. The blade can be adjusted up or down to your desired cutting depth through a hole in the table top. It can also be adjusted to various angles for beveled cuts while its height is adjusted by turning a knob on the front of the saw. The rip fence is actually a bar which guides the work piece as it moves past the blade while the miter gauge is adjusted while moving the work piece past the blade to make angular cuts. It is the bevel system which tilts the blade to make angular cuts. Circular saws have two types of drive configuration motors. In case of direct-drive motors, the motors are linked directly to the blade to transfer the motor s power to the blade. They usually operate on 120V circuits to produce up to 2hp of power, sufficient to cut thin material sheets. Consuming less electricity, they don t give much kickback, but do not help at cutting really thick things. In case of powerful and stationary table saws, they have belt-drive motors where the power from the motor is transferred to the blade through a belt. 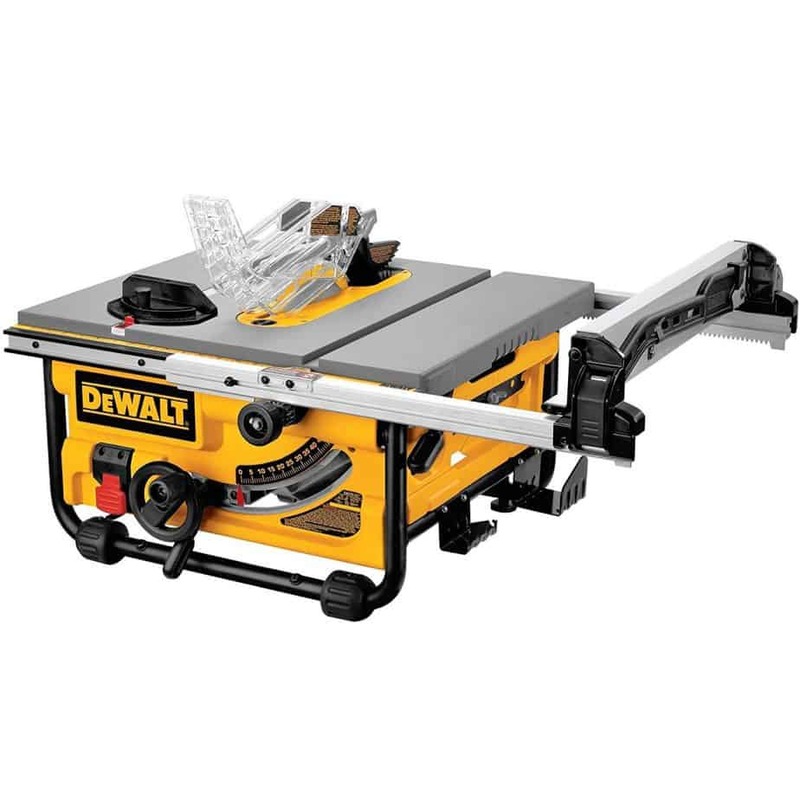 These table saws work on 240v and have motors producing 3-5hp of power and are best for professionals running workshops. The benefit of belt-drive motors is that the motor is offset away from sawdust and thus lasts longer. They thus require less preventive maintenance than direct-drive systems. You just have to check the belts for wear and tear, and ensure it has the right tension. While there are different types of belts for circular saws, Poly-V belts are a better choice as they are more effective and safer than others. Other options available are regular v or wedge belts which are used with traditional saws. While they are good, they don t have the extra factor Poly-V belts have. Dado sets help cut wide and straight slots in a single pass useful in joinery and shelving applications. Extension supports or tables provide a stable work surface while cutting wide stock as they are mounted to the table saw s side. Mobile stands not only provide support but help at rolling the saw out of the way when not in use. 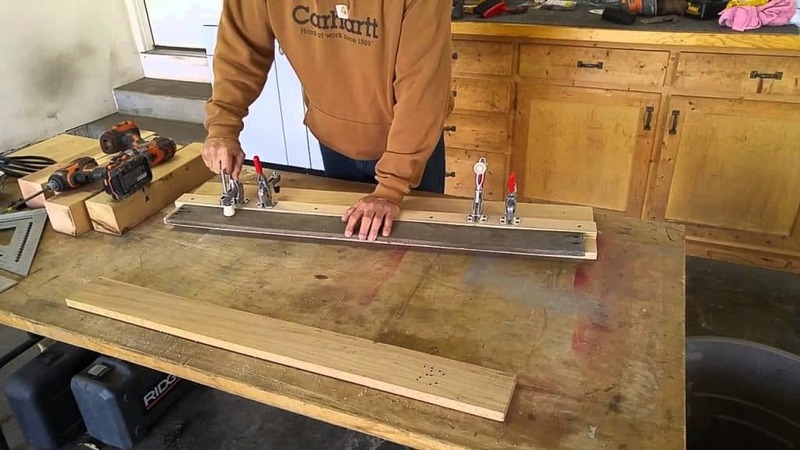 Other accessories you can attach to your table saw to make it an ultimate woodworking machine include router tables, various jigs, cross cut sled, better blades and molding heads. This is a growing branch of table saws as contractors usually come up with their own accessories to increase the saw s working capabilities. These features are found in most table saws of reputable brands. They collectively improve the efficiency of your project while simplifying it. Blade guards provide protection from dust, debris, kickback and accidental blade contact. Amps is the saw motor s power. The higher it is, the more it s cutting power. Extendable rip fences can be folded or slid out for extended rip cutting capabilities as required. Dust chutes and collection systems, and blowers remove sawdust from the work area. Micro-adjust rip fences help you control your work. Arbor or shaft locks make changing blades easy by immobilizing the shaft and blade. Circular saw blades differ in their diameter, kerf size, application, speed, arbor size and materials used for building it. Most saws have 10 ?-12 ? blades while some are as small as 5 ? and others as large as 12 ? which can cut through most materials. Workshops may require bigger blades which are expensive. These saws have between 24 and 80 teeth and while most can cut through materials other than wood, some blades also cut materials like carbon, carbide and diamond tips. Besides the breath of saw blades, its right or left tilt can be advantageous or disadvantageous. 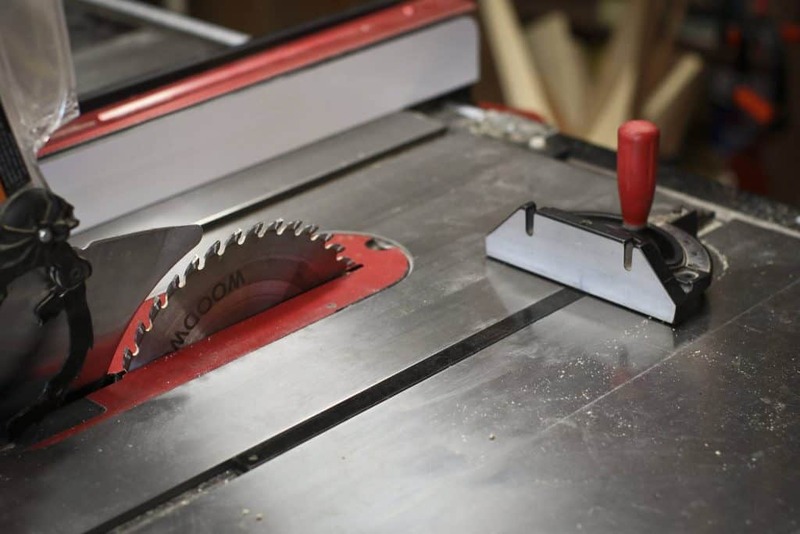 While there are various blades available to choose and use based on your cutting and application needs, it s important you ensure it is compatible with your table saw before buying it. Rip blades are best for cutting along the wood grain direction. Crosscut blades give clean cuts across wood grain. Combination blades are for crosscutting, mitering and ripping. Hollow ground blades give clean cuts on materials like acrylic. Carbide-tipped blades have a hardened finish on its tips which prolongs its cutting life. Craftsman table saws are expensive, and should be bought only after thorough research and making your choice based on your needs and budget. Different models offer different features worth looking into. Price is the most obvious consideration as table saws range from a few hundred dollars for bench top models to a few thousands for cabinet models. If you plan on doing mostly small projects, then an economical saw should be right for you. However if you are a professional woodworker, a larger and more expensive saw is better. Choose your saw based on its capabilities, and the projects you will be using the saw for. Dust collection. As dust quickly accumulates while using table saws, it can get difficult to manage if the dust collection system is not up to par. There s no point investing in a great saw if its dust bag tends to fill quickly. So look for a table saw which has a dust collection system which removes most, if not all the dust. There are two ways in which a table saw manages dust. It may have a port at its back hooked to a vacuum to corral the dust accumulated under the table, or have a shroud over the blade for redirecting the accumulated dust. Most of the better saws have both hooked to the same dust-collection hose. Ease of use. 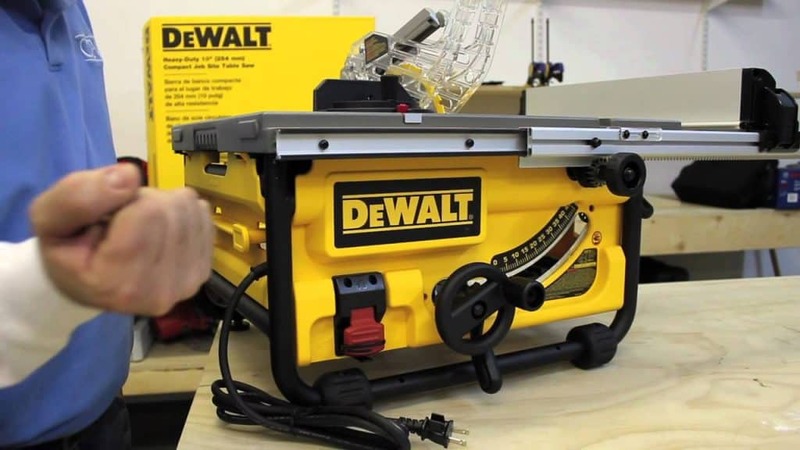 Look for a table saw which can be immediately set up and used without spending hours at the manual trying to understand things and find switches. Buying a complicated table saw wastes time understanding it and you may not even know how to use it right. Storage space. Choose your saw based on the amount of space you have in your shop. Saws used for breaking down plywood have a long table on its right and a long fence rail which may not fit into your office space. If space is a constraint, it s better looking for a contractor or hybrid on wheels. Easy alignment. Choose a table saw which easily and accurately gives best cuts with its blade and riving knife assembly alignment. The blade height, bevel and fence position should also be easily adjustable while its wheels and levers should work with easy lubrication and minimal heavy friction. You needn t have to make several dozen revolutions to raise the blade by a few inches or change its tilt by a few degrees. Strong and durable. Buy a table saw which has more metal than plastic components as cast iron not only provides a stable surface, but also minimizes vibration and is heavier than steel or aluminum. The better circular saws have a smooth and flat table surface with strong legs so that it s steady when set up. While it s difficult to know more about the durability of the motor and other moving parts, a good warranty of about three years indicates that the saw is durable and long-lasting. Power requirements. Consider the available electrical power as most 120-volt tools like table saws need 20 or 30 amp circuit for themselves. It s not feasible to run various tools at a time as it may end up overloading the circuit. Switching the tool to run on 240 volts means it draws only half the current, which is why cabinet saws with heavy-duty motors usually run on 240-volt power. Most contractor saws run on either 240 or 120-volt power; but 240 volts is a more efficient choice and portable saws using 120-volt of power are useful for both job sites and home workstations. You obviously have to look for table saws with safety features as your hands will be inches away from its razor-sharp blade spinning at thousands RPM. You don t want to end up in the emergency room because the blade cut flesh instead of the material to be cut! Features to look out for are riving knives, splitters and anti-kickback pawls which minimize the possibilities of kickbacks. Some table saws have advanced safety systems which help keep your fingers intact. Though flesh sensors may increase the table saw s price, it is really helpful as it stops the saw about 0.01 seconds before making contact with flesh. The magnetic switch is a useful safety feature which ensures the switch goes off if the saw is unexpectedly turned off. This is necessary as if the saw s switch remains on on , it automatically start cutting when plugged in. This not only ruins the work to be done, but is also very dangerous. The addition of a riving knife is important in table saws as it prevents kickback, which may otherwise lead to serious injuries. This is why the latest model saws have a riving knife, which may be missing in old, used, second hand saws. Besides these safety features, practice the habit of unplugging the saw from its power source if you have to adjust, service or change accessories. 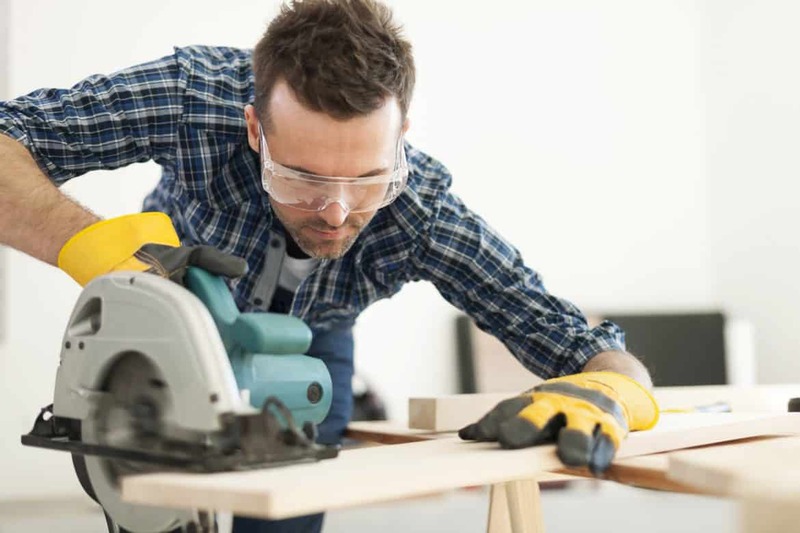 Wear safety glasses while using table saws to protect your eyes from flying shards and splinters. Do follow the manufacturer s operating, maintenance and safety instructions to safely use the saw. It s always better you choose a high-quality table saw as the higher is its quality, the longer it lasts. Moreover, the better brands usually have safety features which protect you while working. Besides checking out the many features, do read the many online circular saw reviews to find out if the saws are just making big promises in their advertising campaigns or are they actually delivering their promises? Most products do have their issues; so read reviews to learn about them. You can also collect feedback from friends and family who own table saws. Determine what you plan to use the table saw for 80% of the time; like if you want to use it to break down large plywood sheets or to build furniture using thin boars. This is important as if you will be regularly cutting thin hardwood and occasionally cutting joinery, then a 1.75hp motor should suffice. If you will be regularly cutting thick wood, then you need a stronger saw, with a strength of 3hp or more. 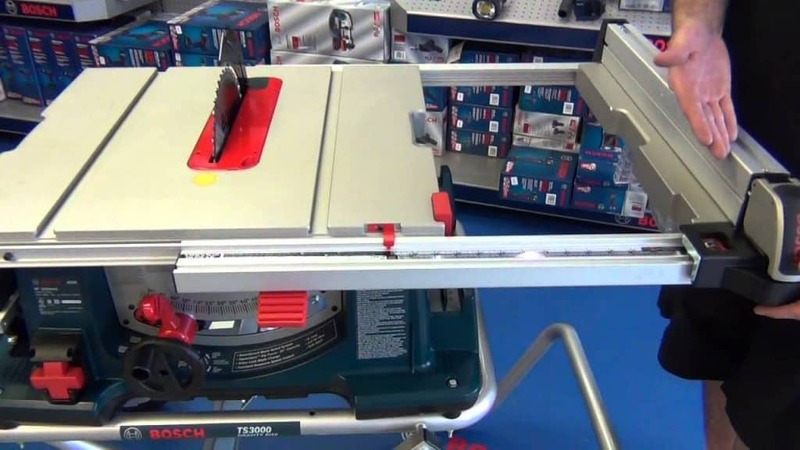 As you will be investing so much of money in the best table saw, it s important you do lots of research, shopping around and comparisons before you finally buy one. 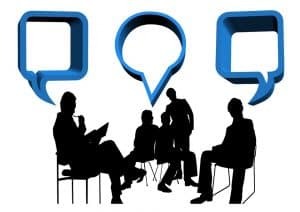 Discuss option with fellow woodworkers, read forum discussions and read reviews from reliable publications to know more about table saws. In addition to all that, this ultimate guide to table saws should help you make your decision. Though it may not be the best, it provides most of the information needed to make an informed and wise decision.